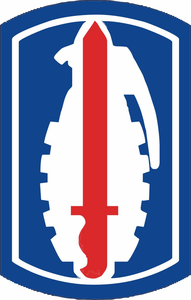 This "91st Infantry Brigade Decal Sticker" is proudly offered by ArmyDecals as one of our 1000�s of Military Decals and Stickers. Made at our facilities in Scottsboro, Alabama, this "91st Infantry Brigade Decal Sticker" is printed on high quality vinyl using solvent inks which will provide long lasting results. After printing, this Decal is laminated and then die cut. Our Military decals and stickers have no excess plastic corners as seen on imported versions of Military Stickers. You won�t find higher quality decals from any dealer.